Before we had kids, Dave and I joked about the day when we would eventually drive a minivan… and now, almost 10 years later, that day has finally arrived! I honestly didn’t think I’d be so excited to drive a minivan, but 3 kids (and a lot of kid gear) later, it definitely seems like the most practical vehicle for this stage of my life. 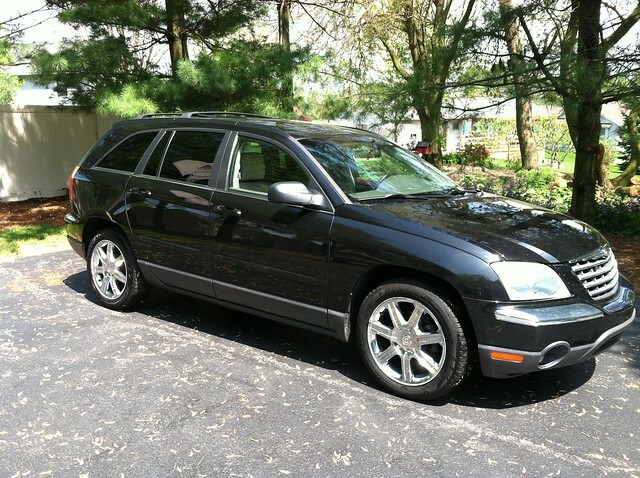 Back when Nora was born, we easily got by with 2 smaller cars; but when we totaled our car in 2012, we decided to purchase a Chrysler Pacifica as a “transition” vehicle — bigger than a car, smaller than a minivan, and not as gas-guzzling as an SUV. We soon realized that trying to buckle one kid in the back by leaning over the kids in the front wasn’t the easiest. And since we were using more of the seats, there was much less storage space for groceries, strollers, etc. In fact, when we went on a vacation this past fall, we couldn’t even fit both pack ‘n plays along with everything else we needed to take. Thankfully, my parents were coming with us, so they took the 2nd pack ‘n play. Anyway, over the past 8 months, it has become more and more apparent that a bigger vehicle was in our near future. We decided to wait until summer to make the switch, simply because we knew we’d have more time to devote to buying and selling a car in the summer. I was fine with waiting. HOWEVER, the most perfect minivan popped up in my Facebook feed back in January… you can probably assume what happened next! The Craigslist ad wasn’t very descriptive, but based on the few pictures I saw (and the friend who posted it for her friend) I knew it was probably worth looking at. 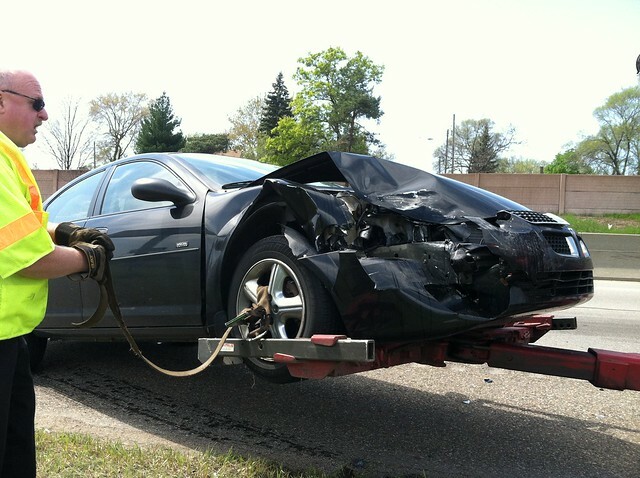 After all, it was black — and we LOVE black vehicles! The next day (Friday), I went to check it out. We test drove it on Saturday and we purchased it on Monday! 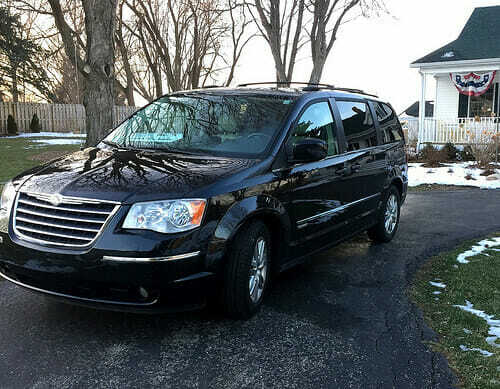 That might seem a little hasty for someone who had committed to waiting until summer to buy a new vehicle — but Dave and I knew exactly what we were looking for in a minivan. We had a rough budget in mind, I had done a fair amount of “research” to figure out what features we might want, and I had regularly searched Craigslist just in case I found something we might like. So when I went to go look at this van, I immediately noticed that it had everything we were looking for… and much more! Although we had quite a long list of “wants”, there were 3 main things Dave and I decided we were not willing to compromise on. Stow ‘n go seats were my #1 requirement because I wanted the ease of being able to quickly change the seating arrangements based on who I was driving around. Right now, we have the bucket seat behind the driver’s seat completely folded down to make it really easy for Nora and Simon to climb into the van and into their car seats all on their own. I can also actually climb right in through this side and clip James’ car seat into the base as well (or I can just walk around to the other door). So far, this seating arrangement has been FABULOUS! This was also one of my “requirements” as I am almost always carrying one or more children, plus a bag, plus my keys, etc. etc. Putting any of those things down to open or close a door is not ideal. Now, I can simply push a few buttons and both doors and the trunk “magically” open as we’re walking out to the car and “magically” shut as we’re walking away. I’m sure some of you are rolling your eyes right now — but I was 100% adamant that whatever vehicle we bought would have a DVD player built in. Our Pacifica had a 6-disc DVD player and it was so handy for longer car trips or if I wanted to run several errands all at the same time. Just let the kids watch a movie while I pull through the bank drive through, get gas, pick up my groceries (curbside service), drop something off at church, etc. etc. 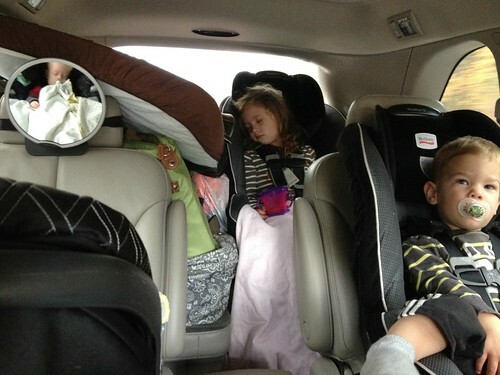 No one is fighting, no one is crying, James falls asleep to the music, and mom can actually focus on driving. 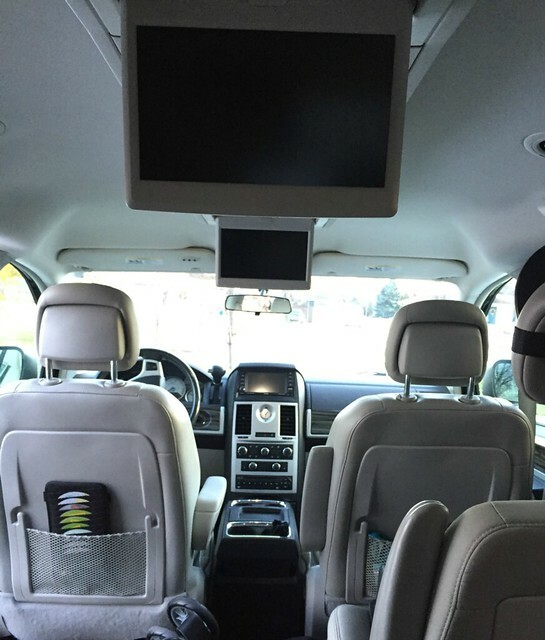 Wouldn’t you know, our minivan has a double DVD player (2 pop down screens) as well as a 3rd screen up by the driver that only shows the movie when the vehicle is in park! The kids think it’s totally awesome (it IS totally awesome)! Of course, I’m LOVING the massive amount of storage space in the trunk — probably 3 times more than our Pacifica when all the seats were folded up! 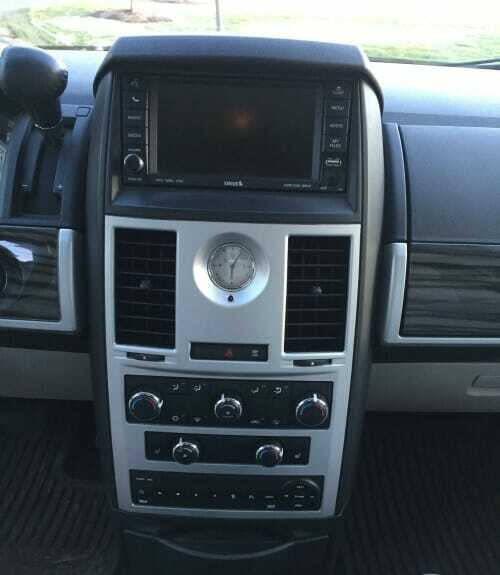 We’re also enjoying some of the additional features like heated seats, rear back-up camera, dual temperature control, separate rear temperature controls, Satellite radio (not sure how long we’ll keep getting this as we never paid for it) and the Uconnect feature that works with our phones. Needless to say, our minivan was a fabulous purchase that we will hopefully be able to enjoy for many years to come! Do you (or did you) drive a minivan? Filed under: Family • Travel • Misc. yes, good idea! I’ll put this on my list for future posts! We still love the van though! Nora and Simon are in the back in booster seats. James and Clara are in the middle bucket seats — it’s working well as the older ones can buckle themselves in! I vacuum out the van every month or so but I “pick up” inside almost every time we go anywhere. I just tell everyone to put any trash in the bag designated for trash and bring anything else inside. It stays very neat and organized this way. We are HORRIBLE at washing the outside of the van! I currently drive a Honda Oddessey (SP?) and love it. I no longer have small children at home but I do have grandkids and I often drive to Chicago (700 miles). 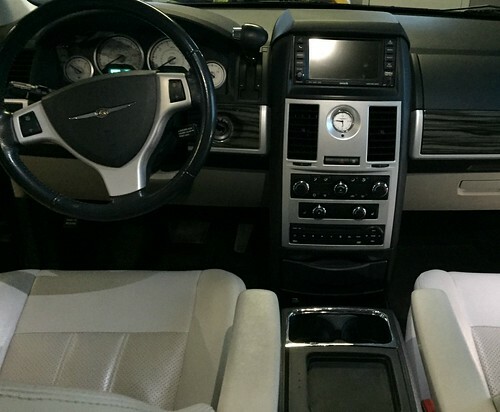 Love the space and the seats are heated and comfortable, I also have GPS which has saved me more than once while in Chicago! I have a lot of arthritis and this vehicle is so easy to get in and out of. I’ll never go back to a regular car again! Glad you are still loving your minivan even with no little kids at home. We are SO glad everything worked out to buy the van sooner than later — we are really enjoying it! I have a 12 year old Sienna that I love! Prior to that we had the first Honda Odyssey, which was more like a station wagon. After the third child, I wanted a bigger van, but I loved having all three kids in the middle row of that Odyssey! When the new Sienna came out with the 60/40 split rear seat, I was ready to switch. My kids are 20, 18 and 16 now, and the van has 185,000 miles on it, but it still drives so well. It has so much room – when we took our daughter to college last fall, we fit the entire family and all of her stuff! And believe me, she had plenty of stuff – so much it didn’t all fit in her dorm room, so we brought some stuff back with us! Minivans may not be “cool”, but they are so practical! This post is so timely. My husband and I were just talking about our favorite mini-van this week. We both agreed (in unison actually) that our Town & Country was hands down our favorite. Kids, stuff, and room to spare! Oh those were the days. Enjoy your new ride. yay! Glad to hear you guys both liked that van. So far, Dave and I both REALLY like it! Here’s hoping we have lots of fun family memories in that van! We bought a Town & Country right after we had our 3rd child too. I was also adamant about having the DVD players. We travel a lot and they’ve saved us so many times. I seriously love our van at this stage in our life! Minivans really are th best with kids. We got our first minivan when our first child was born and now 12 years later we are on minivan #2 and child #5 ;). Thinking we should have purchased a passenger van rather then minivan #2. Hahahahaha. 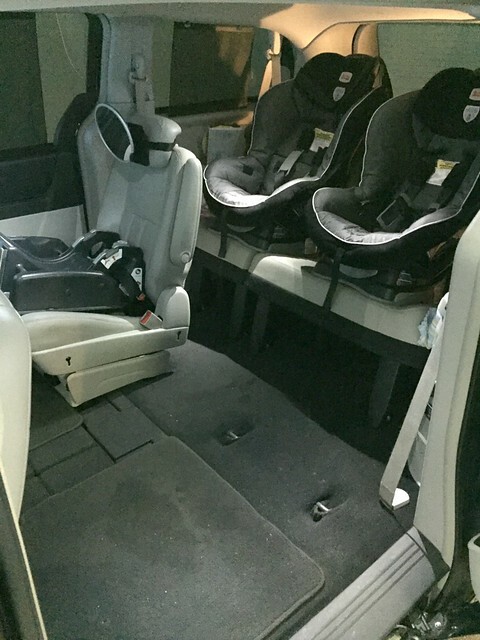 haha — a family from church just got a 15 passenger van but they leave the back bench out (they have 6 kids)… and a friend of mine who also has 6 kids just sold her minivan to buy an SUV. It has an “extended” back so there is an option to put an extra small bench way in the back. Awesome! Where did you get the mirror for the carseat? Haha, this is honestly cracking me up. 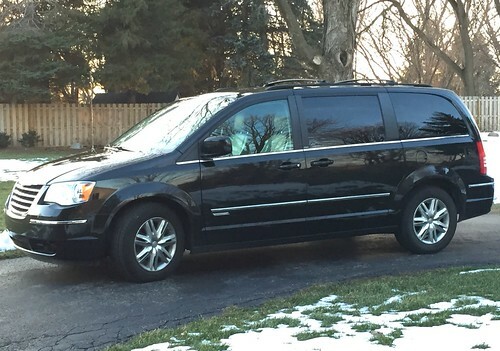 My husband and I have been talking for a few months now about trading in our SUV for a mini van- we also have three children- our third was born last year! There’s something about adding the third child that makes a mini van a necessity! We got our first van when our 3rd child was born. My kids are now 22, 20 and 18 and we just got rid of van #2 and replaced it with a new Honda Pilot last month. At this stage, we are moving kids in and out of college every few months So I’m not convinced I will like having a smaller vehicle. Your van looks great! Enjoy those babies. The days sometimes seem to last forever but the years will fly by! We had the equivalent of a minivan (Toyota Tarago) about 35 years ago: with four kids it was a real blessing. I was so happy that all the kids could pile in from the kerb side – I didn’t have to worry about kids and doors sticking out into the traffic. It had a sunroof (actually it had two, whimsically called the sunroof and the moon roof!) and the whole family still remembers the time we rented a second floor holiday apartment with a balcony which overhung the parking area: the packing up at the end of the holiday consisted of handing cases and boxes over the balcony railing to the two tall kids standing through the roof,then passed down to the one stowing them at the back!! sounds like fun! we don’t have a moonroof or a sunroof with this van — we had one with the Pacifica and it was really nice. However, with our van, there are actually little storage compartments that pop down from the ceiling and the kids think they are really cool. I have no doubt those little storage cubbies will soon be filled with all their little treasures and tchotchkes! I am a senior citizen mini van driver. We spend time between GR and Charleston SC so are always hauling things and/or grandchildren. Tried a SUV for the more sporty look and can say that was the only plus side for me. This is my 4th mini van over many years and do not think I will have a regular car anytime soon. I Love it! My grandma actually still drives a minivan and she’s in her mid 80’s! She says she likes that it sits up higher than a car but not as high as an SUV! A DVD player IS a necessity! And I’d like anyone who thinks it isn’t to spend hours in a car with a child who doesn’t like riding in the car. Total lifesaver!! Your minivan looks great! haha — yes! Nora screamed for the first 9 months of her life… and then we got a DVD player. “back then” the law was that they had to be rear-facing until age 1… but I turned her around at 10 months because I just couldn’t handle the non-stop screaming anymore. She watched Baby Einstein DVD’s and I never heard another peep from her — glorious! We have the T & C swivel n go. It’s like yours, except the bucket seats in the middle row turn to face backwards if you need them to and then you can put a table between the middle row and back row. Mostly, I just used it to swivel the seat a little bit, then I could bucket the kids in the back row. We also have all the storage of a sto n go. And our back rows can fold down flat into the floor too. We like it for now…it was a necessity when the twins were born! But I would love to go back to an SUV someday! So you can drive with the middle bucket seats facing backwards?! Yes, I can!!! The only thing is it’s not safe while kids are in car seats. So, someday I can!!! Yes, we read about the swivel seats, but those did not come on our van. Growing up, Dave and I both had vans with swivel seats and thought they were SO cool! Looks great! My husband is adamantly against a minivan but I have a feeling one may be in our future if we have more kids 😉 I’d really like to keep them rear-facing until age 4 for safety and it’s hard to fit rear-facing seats in a regular car!! wow — how exciting! Enjoy that new car smell!! Nice van!! I love that the second row seats can be stowed away, too. My only regret with our minivan is that we didn’t get one a year or two sooner! How exciting! It looks like you held out for some super useful features. Every winter I dream about a car with remote start 🙂 Someday…. Actually, I dream more about living somewhere warm where I don’t care about having remote start, haha! We are going to start looking at vans this weekend! We had our second daughter in December and our cars are feeling cramped. We think more children our in our future so we are going to get a van. I cannot wait! I have most of the same requirements you do, including a black exterior. We are hoping to own one by summer if we can find a deal. I used to be a zippy hatch back chick, but since two boys…now I am totally in love with my 2012 Nissan Xtrail (the previous box-shape). We can pack SO much in the back and I love the extra cubby on top of the dash board. The new model is really silly and lost so much of the great features – I’ll have to hang on to this one as long as I can!